To begin the project, I started with a 1/1000 scale version which I sectioned to match the general plans as a "study model". The secondary hull was the first to be modified, chopping it down in length and reshaping the transom. The dorsal is also shortened and widened. The bridge extension was built up of layers of styrene and filed to shape. The aft end of the primary was nipped and new impulse drive filed from bits of .080 styrene. The angled warp pylons were also cut from .080 and rounded over. Last edited by AdmiralBuck; 07-25-2017 at 02:54 PM. Last edited by AdmiralBuck; 07-25-2017 at 02:30 PM. Awesome! Oh, how I would love to see a bigger version of this, I mean. I know you are building it but seeing these pics of the small prototype...wets my apatite. Last edited by Road Warrior; 07-13-2015 at 02:33 PM. Love it! Can't wait to see the big version! 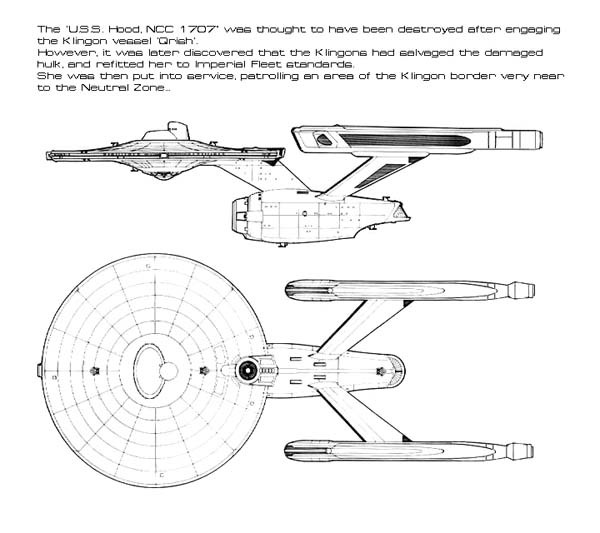 According to Ships of the Star Fleet - one of our common "fanon" references - Hood looked like Enterprise, got a TMP-era refit, and was eventually lost to the Klingons. Are you really attached to that name? How do you feel about Eagle...? Thanks! Except... it's a package deal. Sorry. My Hood does resemble most of the Constitution class ships and in my universe, she is slightly modified. I'm not building another Enterprise. I usually start with the name and work from there. But like all things regarding "canon" and "fanon" - finding a name AND registry that isn't claimed by someone somewhere is next to impossible. Best I can do is what I think is best for me. After all, none of this fictional future is set in granite. Last edited by AdmiralBuck; 07-14-2015 at 08:36 PM. We each build for our own little part of Trek. As we see it. BTW, referring back to SCI-FI's comment... Here's a nasty cut & paste I made and submitted to Jim Stevenson so many years ago, based on the incident SCI-FI is referring to from The Ships of the Star Fleet book. Last edited by Jim NCC1701A; 07-15-2015 at 05:23 AM. I'm not totally opposed to renaming the ship as Eagle. The question to her registry number takes several turns. FJ numbers her as 1719, Okuda and Jein give her 1685, and a reference in Trek IV makes her 956. The ship's emblems still work using the bird icon. The Hood's registry (originally 1707) was later confirmed in 2008 in the remastered "Court Martial" display of listed starships as 1703. This was also supported by Jein. Last edited by AdmiralBuck; 07-15-2015 at 07:08 AM. If you're looking for opinions, I say leave her as the Hood. A courageous name for an elegant lady. The problem with fandom, is there are as many versions of ships and names as there are fans, and each with their own interpretation that is perfect. I say do as you will, and we shall love her anyway! You could always consider this version as an intermediate rebuild of the ship using the Constitution/Enterprise tech already developed. Hood became a testbed for this tech insertion that would later all come together in the complete 1701A upgrade. Later, Hood would then be taken for a complete refit to bring her up to full 1701A standards. Yep - I've envisioned this as a very late TOS - maybe season 5 version of Hood following a refit. Nice! The master is at it again! Thanks! The 1:1000 study version was primed with Tamiya Gray. I'm still exploring the reshaping of the B/C deck. While I did not want to go totally off the reservation on this build, the designer in me can't stop tweaking it. Another round or two of mods before the 350 starts just to make sure I'm 100% with it. The central B/C deck needs to be widened to better flow to the aft end. A recessed pair of photon torp tubes will be mounted aft as well and the impulse deck will be contoured more into the primary either as a slightly raised flat "hump" or recessed. Last edited by AdmiralBuck; 07-25-2017 at 02:58 PM. Looks good to me! Even though I like the big stuff, I'd bet there'd be folks who'd love a kit of that in 1/1000.